Be the first to get rid of your cards by putting your letters at the end of the central word. Always keep in mind a word that begins with the letters of the table or...bluff!!!! Use joker cards to multiply the possibilities. Penalize your opponents with special cards. 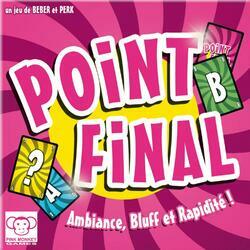 Be the quickest to set the FINAL POINT. Contents of the box : 62 letter cards, 30 jokers, 18 special cards, 1 game rule.